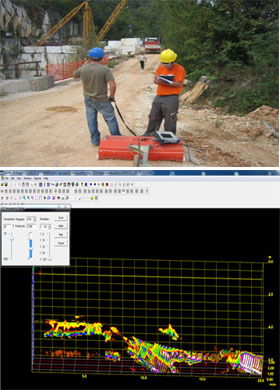 Georadar (Ground Penetrating Radar GPR) is a non-invasive method of material analysis based on the transmission of electromagnetic waves in materials. A part of the electromagnetic wave is reflected when a limit is reached between two materials with different electrical properties. 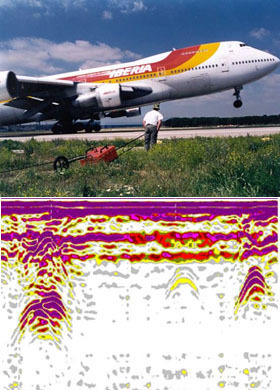 The reflected signal generates a two-dimensional “depth-distance” record or image of the subsoil, along the entire line of displacement of the antenna and is recorded for further analysis. Making continuous measurements in space. Speed of taking measurements and data interpretation. Wide versatility of the equipment for a large number of applications. Determination extent of a contaminated area. Detection of oil pollution on the water table level. 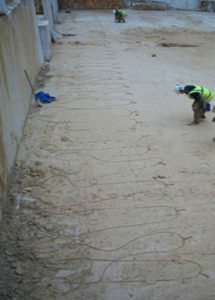 Construction of the geological map of the surface. Detection of natural and artificial cavities. Study of fractures and holes in tunnels, etc. Location of pipes, cables and other subsurface services. Inspection of asphalt pavement and concrete structures. Exploration of minerals and raw material. The purpose of geoelectrical imaging techniques, such as ERT, is to produce spatial models of subsurface electrical property distributions. Through the application of ERT, features with a contrasting resistivity to that of surrounding materials may be located and characterised in terms of resistivity, and their spatial extent and shape. During the course of an ERT survey a series of four-point electrical resistance measurements (consisting of a current, C1-C2, and a potential, P1-P2, dipole) are made. 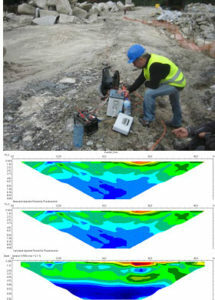 A 2D ERT survey usually employs a set of stainless-steel electrodes (in spike- or plate-design) aligned along a straight line and connected via multi-core cables to a computer controlled automated measurement system collecting a large number of electrical measurements. 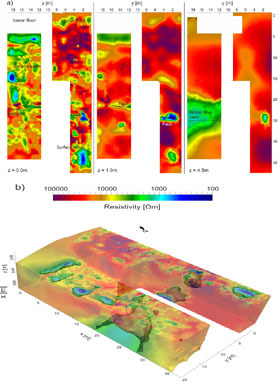 An inverse problem is solved to derive models of the subsurface resistivity distribution from the acquired data. In simple terms, this is done by comparing the response of a resistivity model with the acquired data and adapting this model until the difference between calculated and observed data is sufficiently small. Identification of altered rocks; location and definition of the extension of the alteration band in granitic terrains. Determination of alteration coating on metamorphic rocks such as shales. Location of fractures in calcareous soils covered by a layer of clay material. Location of galleries and karstifications. Identification and mapping of archaeological remains. 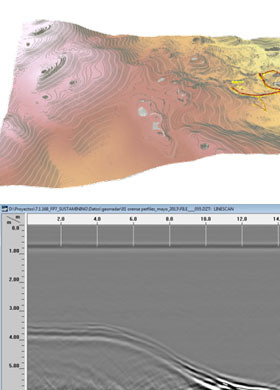 Download NOTIO Electrical Resistivity Tomography (ERT) dossier.